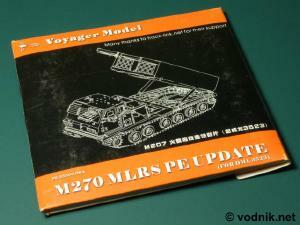 PE35006 set is designed for Dragon's 1/35 scale model of M270 MLRS (Multiple Launch Rocket System). It is packed in a Voyager standard thick paper compact disc case with instructions printed on three sides of two A4 size paper sheets and a resealable plastic bag with all parts inside. Two larger PE frets are directly in this bag and two other frets are in a smaller zip-bag put inside the bigger one. 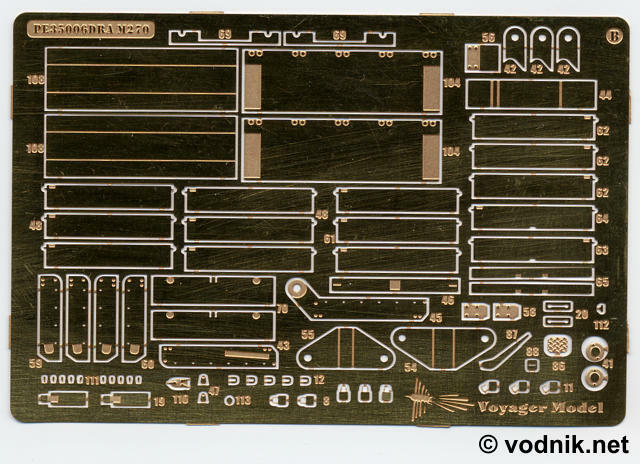 This way of packing does not provide enough protection for brass parts, as in my set some of the tiniest details were damaged - I think Voyager should have added pieces of paper separating photoetched frets from each other (like Eduard does in their sets). 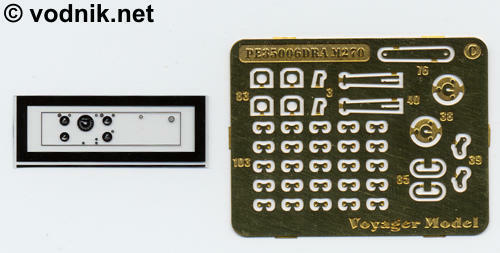 Aside from brass parts in Voyager set we also get two ABS rods and a piece of acetate film with dashboard instrument faces on it. 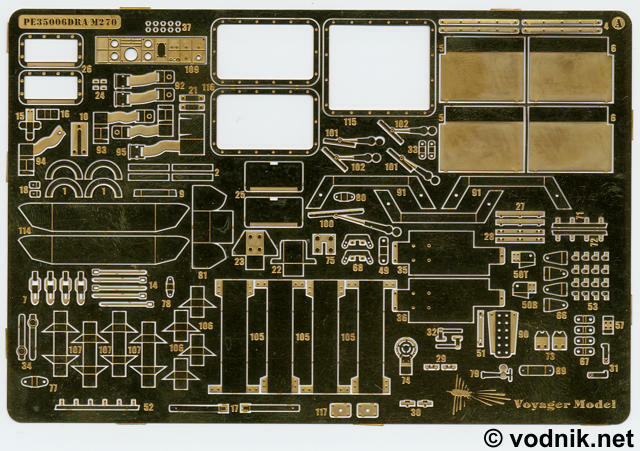 Additional parts: a piece of acetate film with dashboard instrument faces, 102 mm long 0.5 mm diameter ABS rods and 64 mm long 1 mm diameter ABS rod. - front and rear mudflaps. - towing cable mounting brackets - unfortunately in this Voyager set we don't get copper cable, as in some other of their products, so you need to use kit part or find replacement from other source. One omission here is the lack of straps, which hold the cable in place. At least these are not mentioned in instructions, but you can find tie-downs and extra straps on frets A and D and use them! - shovel mounting brackets, tie-downs and straps. Only two tie-downs and one strap are shown in instructions, but there should be four tie-downs and two straps attached - check your references. Luckily enough parts is provided on frets too add those details. 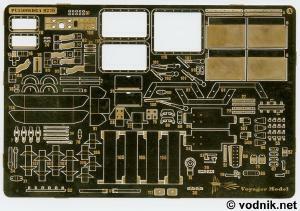 - a lot of details for both the interior and exterior of cab doors. Details seem to be generally accurate, although some minor details are missing and outer door handle made of flat strip of brass does not look convincing at all. And a lot of tiny parts are attached to each door (2 x 22 parts! ), so the assembly isn't easy. - inner framings for cab windows with very nice bolt head details on them. - windshield washers. They seem to be a little too wide. - headlight guards, horn face and signal light mount brackets. - seatbelts for all three seats in the cab. - engine intake grille mesh and lifting eyes and handles for engine access plate. - mesh for air filter intake (I guess this is what it is...). This mesh should be much finer than the one in Voyager set. Actually even in instructions much finer mesh is shown on a drawing, than the one provided in brass. 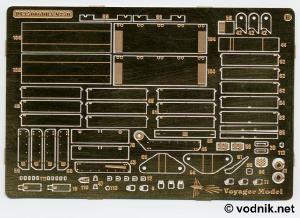 - pedals and dashboard instrument panel with acetate backing sheet and microscopically small separate brass switches. - tie downs for cab top. 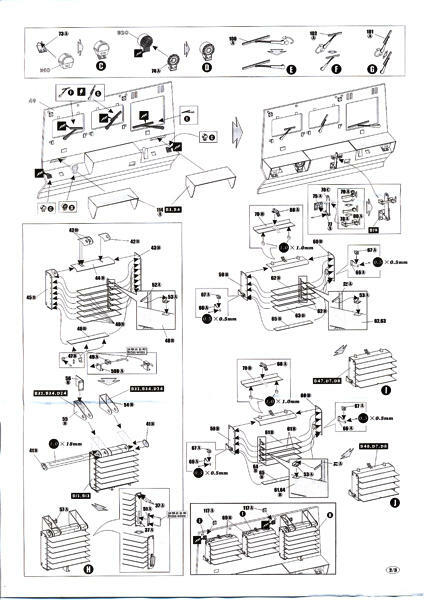 21 are shown in instructions, but in reality there should be 26 attached. These (parts 103) do not look convincing, being too short and too wide. Also only 25 of them is available on fret C. I noticed that different type of tie-downs is also provided as parts No.13 on fret D. 32 of those are provided, while only three are used according to instructions and they look a bit better than parts 103, so using them instead is an option. 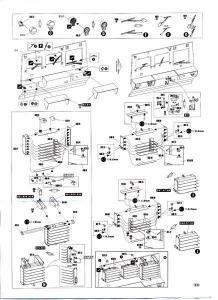 Unfortunately if you add four extra tie-downs not shown in instructions to shovel and towing cable, you will only have 25 of parts No.13 left. You would be one tie-down short if you want to add accurate number of them to the cab, shovel and towing cable. - two large square frames - parts of the missile pod loading system. - some other details, most of them hard to describe without detailed knowledge about MLRS. For example included are tiny padlocks - five closed ones and three open. Unfortunately one of them was damaged in my set. Photoetched fret C and acetate film. Click on picture to enlarge it. Photoetched fret D.
Above I mentioned some errors in instructions and can add that there are also some minor other mistakes, e.g. part 19 is shown as attached to fret C, while in fact it can be found of fret B.
I dry fitted some of the brass parts from the set to their plastic equivalents from Dragon kit and the fit seems to be very good, so I don't predict any problems in this area. This Voyager PE update set seems to be very difficult to use. 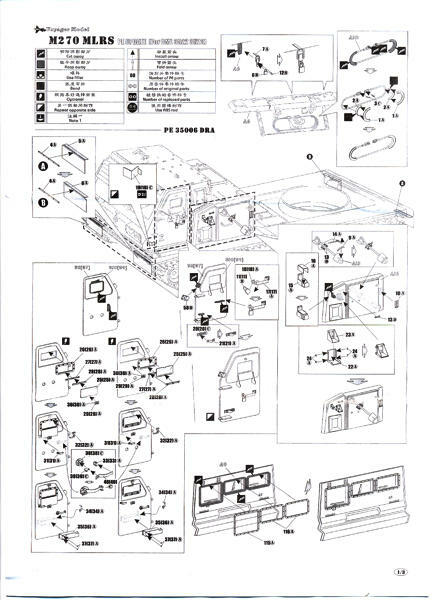 A large number of very small parts is included and assembly of very complex windshield covers is a real challenge. 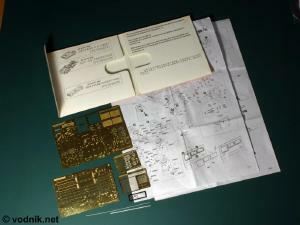 A lot of experience and even more patience is required to assemble all parts in this set. Voyager also offer two other sets for MLRS models: set 35007 contains details for rocket pods and set 35014 contains parts specific to German version of MLRS called MARS and released as a kit by Revell of Germany (Dragon kit with some Bundeswehr specific parts added). Reviewed set is rather a mixed bag. 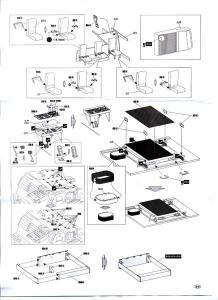 It is difficult to assemble and contains some errors. At the same time it includes a lot of great looking details, which could greatly improve the appearance of Dragon's MLRS kit. 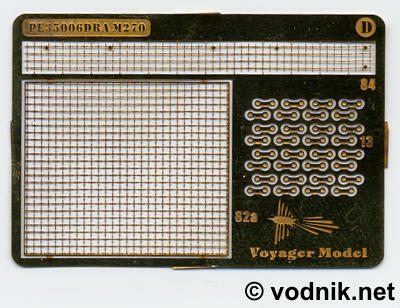 I think however that the Voyager set is only worth purchasing if you decide to use highly detailed louvered windshield covers, which are most important parts in the set. 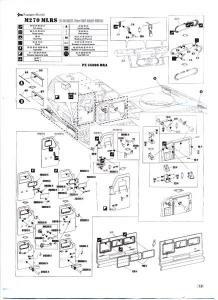 But as I wrote earlier they are not fully accurate and may not look quite correctly once assembled, so you need to take it into account making your purchasing decision.